Civil registration began in 1864. Records of births (from 1864), marriages (from 1870), deaths (from 1878) are available up to 100, 75, and 50 years ago respectively at civilrecords.irishgenealogy.ie. The missing marriage and death records are expected to be added before the end of 2018. Census records are available at http://www.census.nationalarchives.ie/. The relevant District Electoral Divisions are Annaghdown, Liscananaun, and Killower (mistranscribed as Killoner in 1911). No distinction is made between the two electoral districts of Annaghdown, in the Unions of Galway and Tuam, respectively. None of the surviving nineteenth century census records relate to Annaghdown or the areas surrounding it. 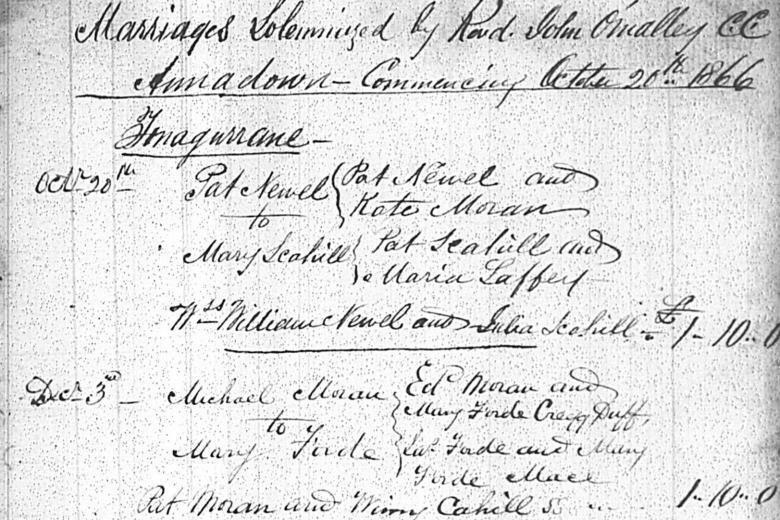 Parish Registers (baptisms and marriages) for years 1834-1880, are available online at http://registers.nli.ie/registers/vtls000631988, and can now be searched for free at http://search.findmypast.ie/search-world-records/ireland-roman-catholic-parish-baptisms. Note that there are several gaps in the Annaghdown registers, most notably for 1869-1875. These may be substituted by searching the Registers of Births for Turloughmore (Galway Union) and Headford (Tuam Union). A list of links to the relevant pages is available here, and the records can be searched at civilrecords.irishgenealogy.ie. There are several gaps in the records, for various reasons. Baptisms (1811-1877), marriages (1815-1856) and burials (1835-1856) were recorded. All of these records were lost in the Public Records Office of Ireland fire in 1922. Corresponding civil marriage records from the 1850s onward survive, and will eventually be available on civilrecords.irishgenealogy.ie. The records for Lackagh, which was united with Annaghdown, were similarly lost. Griffith’s Primary Valuation of Ireland, giving the names of heads of household in the mid 1850s, are available at http://askaboutireland.ie/griffith-valuation/. A complete set of searchable images is available online at titheapplotmentbooks.nationalarchives.ie. The recorded tithes for Annaghdown are an incomplete listing of tenants in the case of most townlands, although they are in fact better than most of the surrounding parishes. In principle, medium to larger tenant farmers and landholders seem to have been recorded. It should be noted that townland boundaries and names were not standardised until Griffith’s Valuation, and the spellings appearing in the Tithe Applotment Books are largely different from the standard spellings..
Limited voluntary transcriptions are available on the Find A Grave website. Transcriptions for Annaghdown Abbey have been completed and are available here.